The QQ Design Team gets to play around with the Club Q items a few weeks before they're shipped to the masses. (tough life, I know) ;) These projects were created using the items that will come in the Sept Club Q kit featuring the Cherry Truffle paper line. It was love at first site for the Design Team and the mini album is just to die for! Not a Club Q Member yet. Join before Sep 15th to get this month's kit. Get more details here! 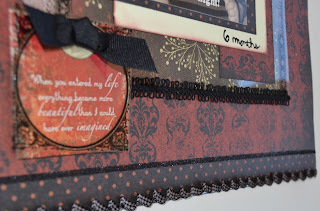 Here is what Adora says about her project: I love this September Canvas Kit !!! !It’s a 6x6, 28 page album. Yes, 28 pages of full fun! I love the thickness of this album. I love the little pocket pages for hidden journaling; memorabilia’s; or maybe more pictures, it add so much character to this album. I really enjoyed putting this project together; hope you’ll have as much fun looking at it. Thanks! I used the inside pieces of the diecut leaves and border to embellish around my journaling strips. I cut the long vellum quote into 3 sections, mounted them on cardstock, and then inked the edges. The 3-in-1 Beacon glue is great for adhering the strip of gems. 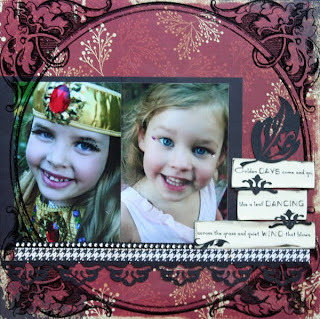 I adhered the black mats and the photos onto the red pattern paper. Everything else was adhered right on top of the transparency. I kept them as 2 different sheets and just slid them both into my page protector. LISA - 6 months old! Items used: Sept Club Q items, Bloody Mary chalking ink, Vintage alphabet quote sheet, white doily from Aug Club Q. Details: I distressed my white doily by chalking it in Bloody Mary and then adding Glimmer Mist in 'Chocolate covered Cherries.' I used the Vintage alphabet to cut out the 'E' and also put a vintage quote behind a piece of acetate. 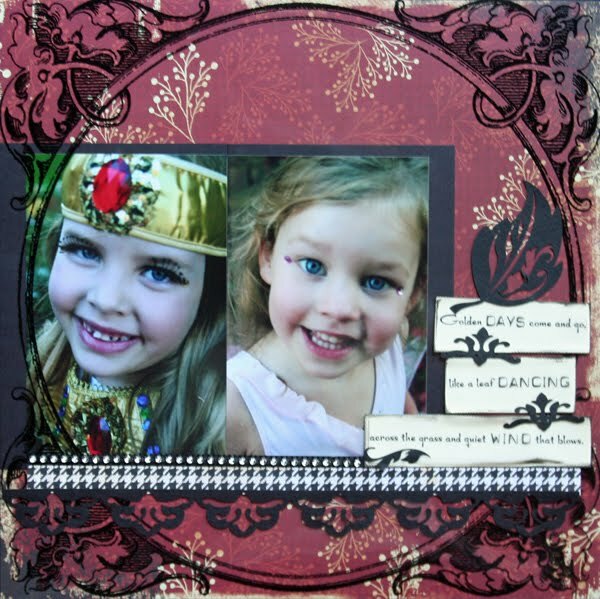 I used glitter in many places on this layout which I will show you below. To get this look I added liquid glue behind the flower acetate (add glue to the duller side). Then I layered on 3 different colors of glitter from PK Glitz. 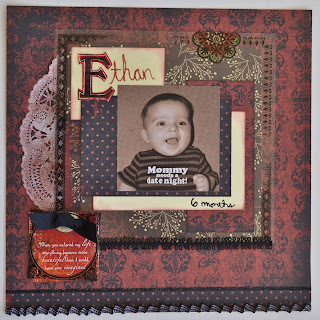 To create Ethan's name: I cut out the E from QQ's Vintage alphabet and then wrote the rest of his name with a glue pen. I sprinkled glitter on top and used PK Glitz's static free brush to clean up my layout. I also used the glue pen to write '6 months' and then added black glitter on top. This picture shows the folding of my ribbon and also a line of black glitter across the bottom border. To create this look I used a skinny tape adhesive (many out there are made for glitter) then added my glitter on top. project for the FRI Challenge 8/26. Julie I have a thing for Circles so I just adore it.